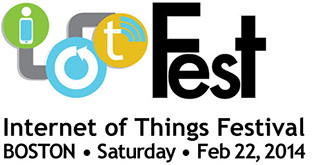 The other day I attended a gathering at MIT titled “Internet of Things Festival“. If I wrote that ten years ago you would probably wonder what I was talking about (unless of course you worked with or knew Kevin Ashton). In the past few months the phrase “Internet of Things” has gone from obscurity to ubiquity. The issue for me is that people are still trying to get their thoughts around what devices make up this IoT when they should be fleshing out what IoT could really mean. This festival was good in that it had presenters covering a wide variety of technologies underpinning the Internet of Things as well as what futures the Internet of Things might bring about. The list presented in the introduction as “What IoT is” had line items that included products that could fall in this category, technology that enables IoT, and concepts that are already becoming commonplace like cellphone control of appliances. What Internet of Things should be associated with is not the things themselves but what we will be able to do once we have tracked how we use these things over time. A user experience can be guided and improved by the prior interactions and normal wear and tear on everything we use. It is this combination of the data acquired over time and how it is made actionable that will make the Internet of Things a real thing. Without this we are just connecting lightbulbs so we don’t have to get off the couch to turn them on and off and we’ll never get past the mental model of the remote control. Google did not buy Nest for billions simply to have a connected thermostat. Nest got this idea of collecting data over time and making it actionable. If we want to really make an Internet of Things that is world-changing we need to develop products that use the data from these devices and from that data create a net increase in the quality of our lives.